The first thing I learned on my walking tour of London is that it is incredibly difficult to write legible notes whilst actually walking. I mention this now as I’m sitting here trying desperately to decipher my scribble like an archaeologist working on the Rosetta Stone. What I can tell you without the help of my notepad is that there really is no better way to see a city than by foot, and that there is no better person to do so with than a guide who not only knows their way around the city’s maze of busy streets, but also through its copious volumes of history as if they were chapters in his own autobiography. Jim spotted me loitering outside the Globe Theatre, lost in thought somewhere between taking note of the uncharacteristically glorious London skies and discovering to much dismay that I’d forgotten the battery for my camera. A few handshakes and an introduction to a friendly-looking lady from Wisconsin whose name I didn’t quite catch, and the three of us set off toward the River Thames, which would, as is so often the case in London’s dense history, be the point of reference for the rest of our tour through the evolution of London theatre. It is impossible to separate London’s theatrical heritage from commerciality. 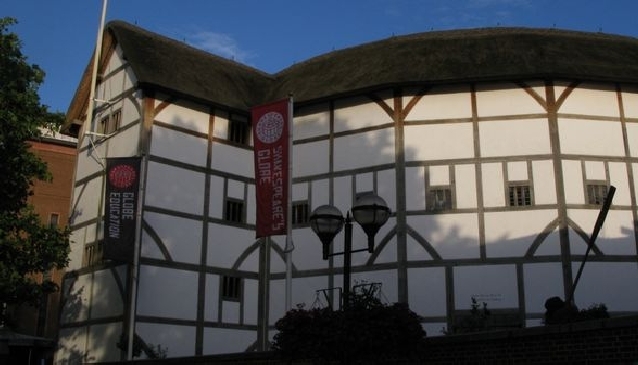 Ever since their earliest days, without being mindful of accessibility and appeal plays simply weren’t sustainable, which is why James Burbage, along with his pal William Shakespeare, one day decided to dismantle The Theatre in Shoreditch and transport it, via Blackfriars, to the city’s playground on the Southbank, where the Rose Theatre was already enjoying huge success. Which is why we were now stood staring at the original sites of these two theatres, scarcely 20 paces apart, struggling to believe that they ever existed in such close proximity to one another. It reminded me of the way a high street kebab shop seems totally unable to exist without at least five other such establishments within a 100 yard radius. The Theatre, at this point, became the Globe, a polygonal structure with an exposed stage that encouraged intimate and communicative performances, nurturing genuine acting talent in a way that continues to this day. Moreover, the familiar atmosphere necessitated a certain amount of adlibbing, a skill which Jim now demonstrated with great aplomb as we made our way across the river, leaving behind the area where, in an incredibly short space of time towards the end of the 16th century, theatre went through an intense evolution and established the bones of the fine art we are familiar with today. Around this time, another form of theatre was blossoming: Boy Players. Associated primarily with the Chapel Royal and St. Paul’s Cathedral, these children would perform theatre pieces to be enjoyed in the same way as today’s multimedia entertainment, Jim explained. One of the most successful of these was Salomon Davey, a young chap who had an unfortunate illness which caused him to cough a lot. It meant he was remarkably convincing when playing the roles of old, decrepit men. Jim led us to a house in Blackfriars’ Convent where Shakespeare once bought The Gatehouse for £140, before pointing out The Mermaid, a significant post-WWII theatre which Jim himself performed at in the final production before its modern redevelopment. And then we hit the mid-seventeenth century, and everything got a bit grim, as one has come to expect from this period in England’s history. There aren’t many ways you can dress civil war, public violence and execution is a generous light, but Jim made a valiant effort, explaining that these events were vital to the city’s theatrical endeavours, while adding that they highlight the apparent relationship between theatre and the metropolis’ seedier underbelly. It was at this point, keen to avoid too many steps in silence as we made our way towards the West End, that I mentioned I live in Deptford, a statement I regretted almost immediately. It turns out Christopher Marlowe, one of the central protagonists to Jim’s story so far, was killed in a pub there, which I can well imagine having happened. Soon thereafter we arrived at the site of John Rich’s New Theatre, where the Beggar’s Opera made Rich very rich and John Gay, its creator, very gay indeed. So much so that Rich was able to re-invest the vast amounts of cash he earned in a new establishment located in the West End, right beside the immensely successful Theatre Royal; a success which Rich sought to emulate. I’d love to say he changed his name to John Shrewd to try and make this happen, but that would be a lie. And so it was that I stood aghast between the Theatre Royal, a dull building I’ve strolled past innumerable times blissfully oblivious, and the Royal Opera House, a magnificently opulent edifice of which I am incredibly fond, and which I had no idea had been established as a competitor to the Theatre Royal. In doing so it provided a paradigm for the modern West End, and echoed the jostling origins of theatre on London’s Southbank. Instead of delving into the city’s dazzling Theatreland that is dominated by the constructions of Messrs Sprague and Crewe, however, we once again made our way south, crossing London’s watery vein to finish the tour at the National Theatre. It was to this area that English theatre migrated towards the turn of the twentieth-century, amidst a backdrop of debate over the bastardisation of quality and tradition. This is what led to the formation of assemblages such as the Royal Shakespeare Company, acting schools such as RADA (the Royal Academy of Dramatic Art), and, ultimately, the National Theatre under the artistic direction of Laurence Olivier. Their combined mission was to uphold the values of England’s rich theatrical heritage, which is pretty much where we find ourselves today. Appropriately, it was here that Jim concluded his tour, having followed the timeline of theatre’s evolution in London in a succinct metaphorical and topographical circle. He had done so with great flare, employing his own theatrical training along with a bafflingly replete knowledge of the city’s eventful past, remaining true to Context Travel’s delightful mantra, ‘walking tours for the intellectually curious’. In fact, I could well imagine Jim being an especially interesting dinner guest, but before I had chance to suggest it, he had exited stage right.